The Hope Is Contagious Campaign was founded by Maggie Watts in 2017. Maggie sadly lost her husband, Kevin to pancreatic cancer in 2009, 40 years after his mother passed away from pancreatic cancer in 1969 aged just 27. Maggie and her friends and family have campaigned tirelessly for more funding and awareness ever since. Maggie says, “The medics could offer Kevin no better a chance of survival in 2009 than they could his mum in 1969 – shockingly, pancreatic cancer outcomes had actually STOOD STILL for 40 years. 40 years with no progress whatsoever! 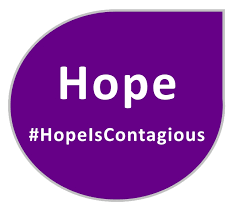 Hope is Contagious is a Charity Fund for Pancreatic Cancer Action and Pancreatic Cancer UK and all excess monies not required to fund the campaign will be sent to both charities to further our work.